Ryan was living with his son at his girlfriend’s home when the relationship went sour. The girlfriend kicked Ryan and his son, Shannon, out of the home with nothing but their clothes and Ryan’s motorcycle. The family couch-surfed for weeks until a local St. Vincent DePaul helped Ryan get a car. Ryan then slept in the back of his car and Shannon went to stay with his grandma until Ryan could find a permanent place for them to live. 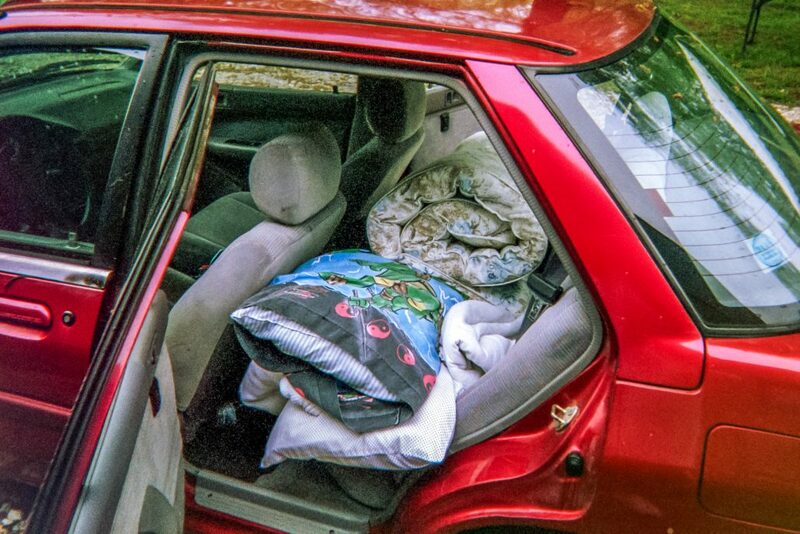 His photo on display shows his reality of homelessness—the back of his car, filled with all of his possessions, including his four-year-old son’s Teenage Mutant Ninja Turtle pillowcase. Ryan also took photos of himself looking for a home on Craigslist and of his beat-up hands from working hard at a job he loves.